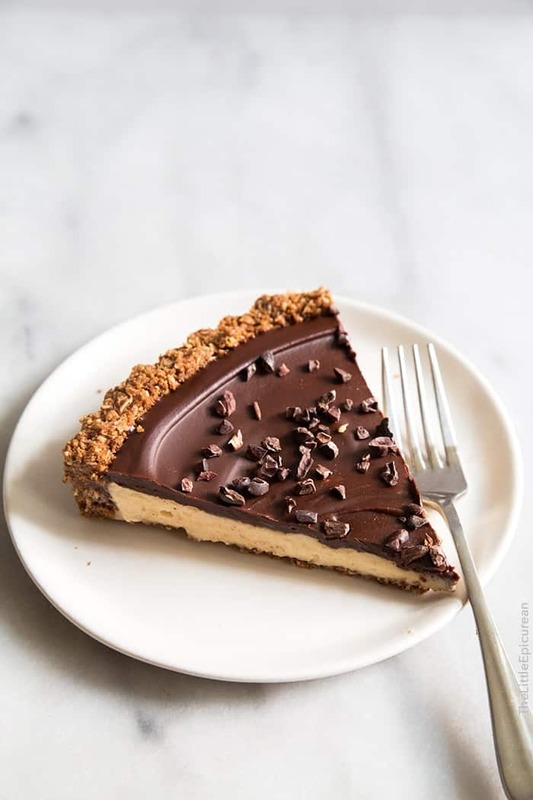 This tart features a cocoa oat crust, honey peanut butter mousse, and a luscious chocolate glaze on top! I always love a good challenge. Instinctively, when I think of peanut butter and oatmeal, I assume cookies. Cookies are tasty and all, but I prefer the unexpected. 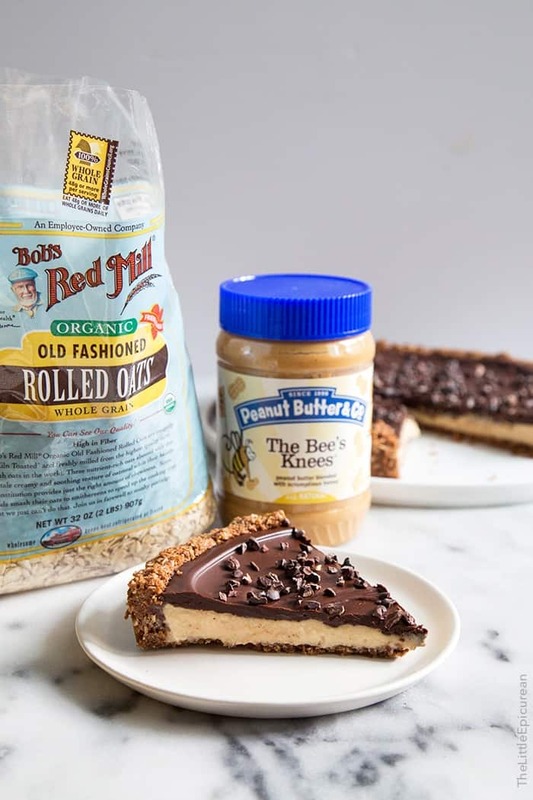 For the month of October, Peanut Butter & Company has partnered up with Bob’s Red Mill to create #Oatober! PB&Co. sent me a jar of peanut butter (their honey version!) and a package of Bob’s Red Mill organic old fashioned rolled oats. No rules, no obligations, no limitation. Complete creative freedom. When it came time to making something, I followed my stomach. 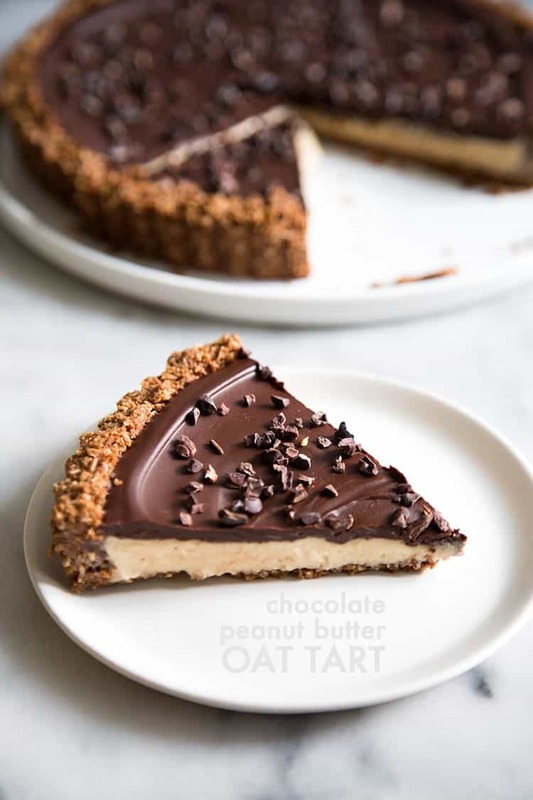 My stomach said make a peanut butter oat tart and cover it with chocolate. DONE. I’m not exaggerating when I say that this tart is AMAZING. 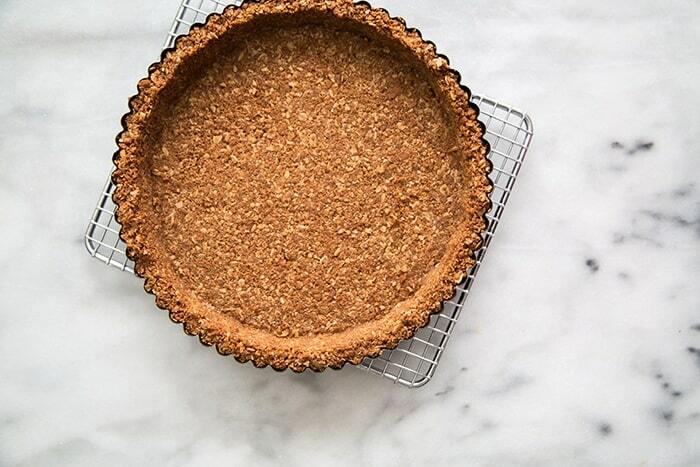 The oat crust is a delicious treat in itself. It’s a combination of rolled oats, graham cracker and cocoa powder. Barely pulse the oats in the food processor. I wanted to keep retain the oatiness of the rolled oats. I did not want to end up with oat flour. The crunchy and substantial crust balances the delicate honey peanut butter mousse. To ensure the dessert isn’t too sweet, I used dark chocolate chips (at least 60% cacao bittersweet chocolate) for the glaze and a handful of cacao nibs to top it off. Pulse all the tart ingredients in a food processor and then press it into the bottom and sides of the tart pan. I suggest using the flat bottom of a drinking glass or a measuring cup to push the crust mixture into the pan. During baking, the crust may puff up slightly. Upon removal from the oven, simply use the glass/cup to deflate the crust and push it back into the pan. It’s a good idea to prepare the chocolate glaze BEFORE making the mousse. The glaze will need to cool slightly before you can use it. The honey peanut butter mousse is fairly straight forward. Whip up chilled heavy cream (in a chilled bowl works best!) to medium peaks and then add in the peanut butter, honey, and salt. Whip just until almost stiff peaks. 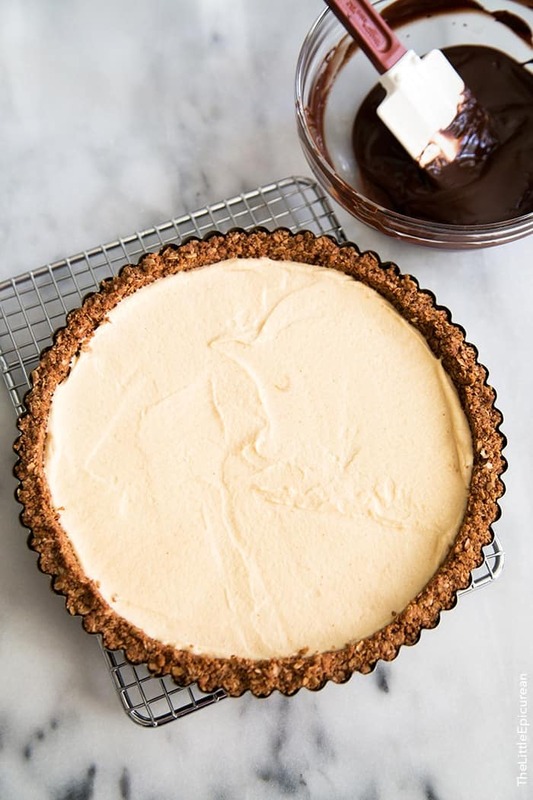 Scoop the mousse into the cooled tart crust. Spread the mousse into an even layer. If your chocolate glaze is taking awhile to cool down, place the mousse tart in the fridge. Just be careful! 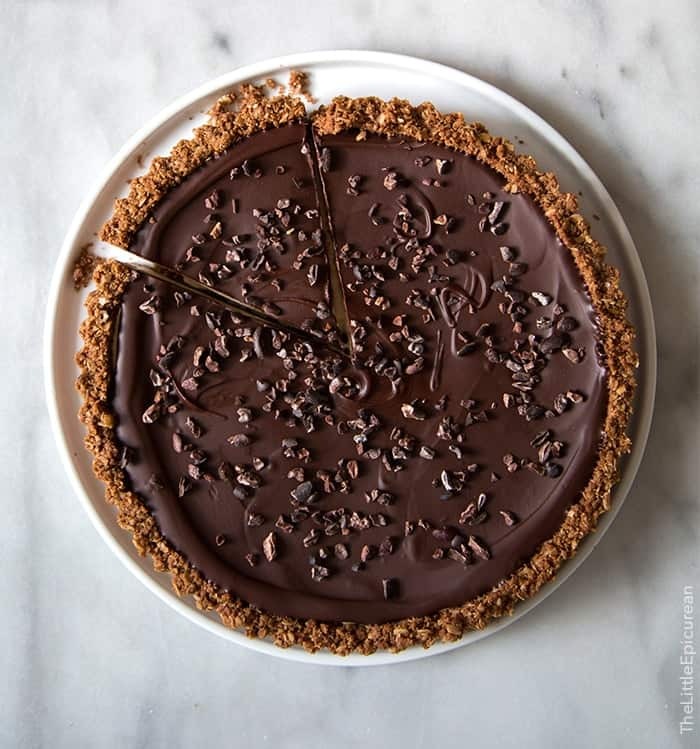 If your mousse tart is too cold, the chocolate glaze will instantly thicken and set up. My advice, my the glaze. Let it cool for 10 minutes or so and then proceed with making the mousse. By the time you’ve filled the tart, the glaze should be good to go. As soon as you pour on the chocolate glaze, immediately spread it into an even layer, making sure the glaze makes contact with the crust. Sprinkle on the cacao nibs and let the tart chill in the fridge until you’re ready to eat. It’s a million times easier to slice this tart when it’s chilled. To ensure clean slices, you a sharp knife and wipe your blade clean after each cut. 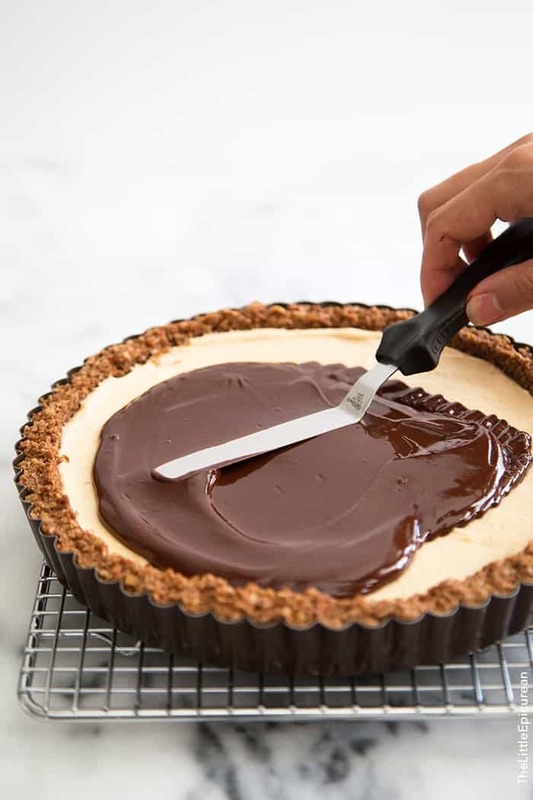 As the tart sits out at room temperature, the mousse may start to soften (depending on the temperature of the room) making it super frustrating and messy to slice. Preheat oven to 350 degrees F. In a food processor, barely pulse together rolled oats, graham crackers, cocoa powder, sugar, and salt. You do not want to end up with oat flour. Pulse just until the rolled oats are somewhat broken up. Add in melted butter and stir until mixture comes together. Press into tart shell with removable bottom. Place chilled cream in a chilled bowl. Whip to medium peaks. Add peanut butter, honey, and salt. Continue to whip to almost stiff peaks. 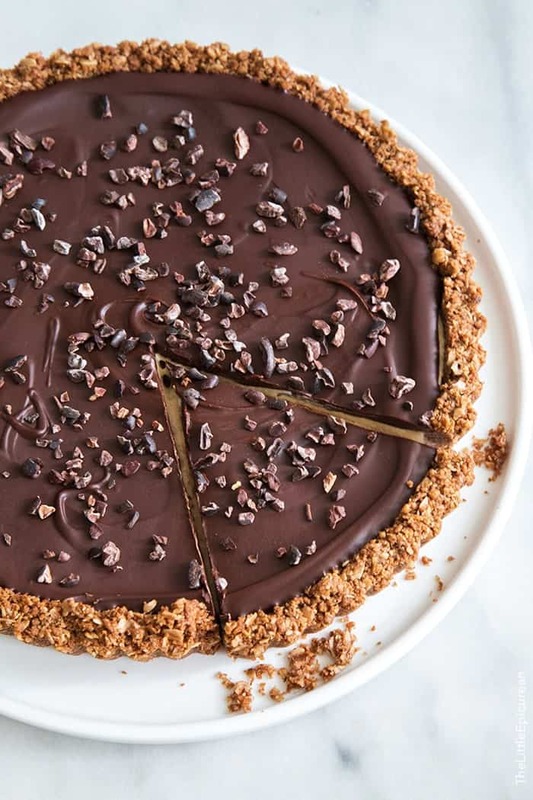 Pour mousse into cooled cocoa oat crust. Spread into an even layer. Gently melt together chocolate chips, butter and corn syrup over a bain-marie (double boiler). Alternatively, you can microwave mixture at half power for 10-15 second intervals until melted and smooth. Allow to cool for 10-12 minutes. Pour over peanut butter mousse and quickly spread into an even layer. Chocolate will set up because of the cold mousse. Immediately sprinkle cacao nibs over chocolate. Set in the fridge and keep chilled until ready to serve. Disclosure: I was not compensated for this post.Peanut Butter & Company provided me with some ingredients. As always, all opinions are my own. OMG! This looks delicious beyond words! I NEED! omg the pictures look amazing! definitely on my to-try-list now. Thanks Filza! Can’t wait for you to try it! it’s always a struggle for me to roll out a normal crust, so press-in ones are enticing (: and i love pb, chocolate and oats, especially all together! Same here! My warm hands end up destroying any rolled tart crust. And this tart?! Instantly Pinned! Can’t wait to give it a try as I love the addition of oats in this recipe. Looks delicious! I totally believe you Maryanne! This tart looks amazing! It’s on my list! This is the next thing I need to make in my tart pan!! I even have PB&Co peanut butter! Your photos are stunning! I love that you got complete freedom when making this because it is absolutely stunning! Love everything about it! Oh my goodness! I’m in love with this dessert! This is one good looking tart!! Epic I should say! Love the sound of the crunchy crust. This looks heavenly! I could go for a the whole pie right now! An oat crust sounds wonderful! Peanut butter and chocolate is my all-time favorite combo, too :). My only question is, how are chocolate glaze and chocolate ganache used differently? I’ve seen you use them both for different recipes, and I was wondering if they can be used interchangeably, or have specific purposes. Thanks, Maryanne! Just found your blog, and this looks delightful! For those of us who have only generic honey and peanut butter, can you please give us a sense of the proportions we should substitute? Thank you! Hi Megan! Simply use the listed amount of peanut butter and honey in the ingredients. The honey flavor in the PB&Co Honey Peanut Butter is quite faint, so you can easily sub in regular peanut butter.